A life-size bronze statue of late Soundgarden singer Chris Cornell was unveiled outside the Museum Of Pop Culture in Seattle, WA on October 7. The tribute – sculpted by artist Nick Marras – showcases the grunge pioneer in one of his iconic poses with his signature boots, dog tag, layers and long locks. The event featured a number of speeches before the statue was unveiled by their children Lily, Toni and Christopher, with Soundgarden members Kim Thayil, Matt Cameron and Ben Shepherd in attendance. 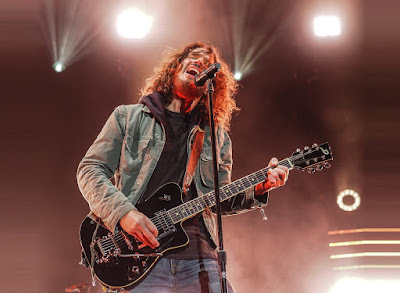 The three bandmates told Rolling Stone that it was “a lot to take in” seeing Soundgarden fans turn out nearly a year and a half after Cornell was found dead in a Detroit hotel room on May 18, 2017, hours after a concert. Cameron and Thayil reunited in June for Denmark’s Northside Festival as part of a supergroup called MC50, joining the likes of original MC5 guitarist Wayne Kramer, Zen Guerrilla’s Marcus Durant, Fugazi’s Brendan Canty and King’s X’s Dug Pinnick to pay tribute to the Detroit-based rock group. The late Seattle singer’s work is featured on the new collection, “Chris Cornell”; due November 16, the package is offered in multiple formats, including a single 17-track release and a 64-track limited-edition deluxe box set.